My new mystery is set in Las Vegas. Yes, Las Vegas. But NOOOOO, not Las Vegas, Nevada. Las Vegas, New Mexico. A town frequently used as a MOVIE SET! This Las Vegas is a historic little town east of Santa Fe, on the east side of the Sangre de Cristo Mountains, straight south on I-25 from Colorado Springs and Denver. My husband and I first discovered this town when vacationing in New Mexico over a decade ago. We were taken with the scenic beauty surrounding the town, and with the many varied historic districts. Not to mention that the weather is pretty close to perfect, with all four seasons and plenty of rain. The town plaza even has a haunted hotel – and my family personally experienced GHOSTS! Today, I want to introduce you to Las Vegas, so I’ve included some of the information from their tourist guide as well as a list of movies filmed at least partially in or around this great town. Las Vegas was established in 1835 and was laid out in the traditional Spanish Colonial style with a central plaza surrounded by buildings which could serve as fortifications in case of attack. Las Vegas soon prospered as a stop on the Santa Fe Trail. In 1846, Stephen W. Kearney delivered an address at the Plaza of Las Vegas claiming New Mexico for the United States. The Las Vegas Carnegie Library, built in 1904, is the only surviving Carnegie Library in New Mexico. Its Neo-Classical Revival architecture resembles Thomas Jefferson’s Monticello. The Museum & Rough Rider Memorial on Grand Avenue was dedicated in 1940, the first such museum established by the decision of Theodore Roosevelt’s Rough Rider’s regiment (the first Volunteer Cavalry Regiment of the Spanish-American War.) The group named Las Vegas their official reunion home and held their first reunion in Las Vegas in the Plaza Hotel, June 1899. Las Vegas has over 900 historic structures listed on the National Register of Historic Places. Many notable homes and buildings were built in the 1890s during the town’s heyday. The town features six separate historic districts including: the Bridge Street Historic District, Old Town Residential District, Railroad Avenue Historic District, Lincoln Park Historic District, Library Park Historic District and Douglas-Sixth Street Historic District. Okay. Here’s where it gets really interesting. Look at all the movies filmed in and around this town. Several scenes in the 1998 film John Carpenter’s Vampires were filmed on the plaza. The 2012 A&E TV Series Longmire starring Robert Taylor and Katee Sackhoff (subsequent seasons have filmed in and around the town. Visit the Las Vegas, New Mexico’s official website to learn more about this historic city and this beautiful region of New Mexico. 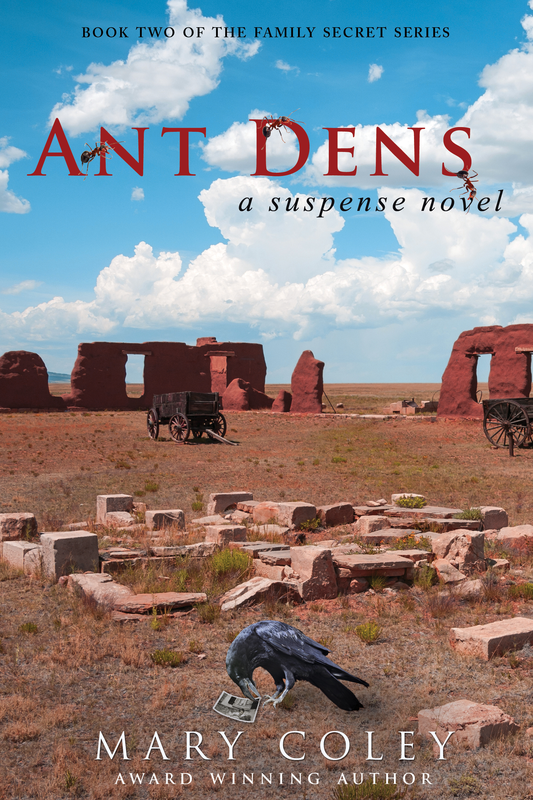 And come back next week to learn more about my upcoming mystery, Ant Dens – a suspense novel.